Although the existence of the British Isles was known to the Romans for many centuries, the first conquest was undertaken by Julius Caesar, with minimal results. In 43 C.E., the Emperor Claudium sent legions to Britain. The conquest was a success and it was made a Roman province, Britannia. Many of the modern cities of Great Britain were founded by or taken over by the Romans. 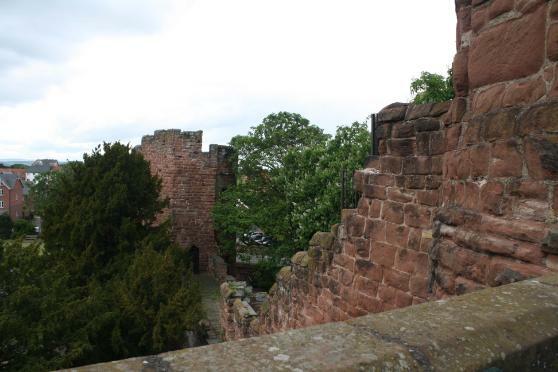 There is a Roman wall still standing within the City of Chester. The capital city, London, was founded by the Romans as Londinium. The Emperor Hadrian built another stone border, called Hadrian's Wall, in Northern England to keep the tribes of modern Scotland out of the province. After the death of the Emperor Commodus, who left no direct heir, Rome was sent into an upheaval. Britannia remained initially unaffected by the deterioration and continued as part of Rome until the 4th century C.E. when the Roman Empire's further decline led to the loss of Britannia as a province. The rebel Queen Boudica of the Iceni (an original British tribe) sacked and burned the city in 60 C.E. This destruction can be seen in the archaeological record as a burnt red layer of debris. The city of Londinium was founded by the Romans after a conquest in 43 C.E. and is the location of the modern city of London, England. The city was a commercial centre and was probably founded as a venture for a private enterprise. Londinium had the added bonus of being close to the Thames River which was narrow enough for a bridge and deep enough for trade ships. This made the city a haven for travelers and traders from across the Empire. The Roman settlement was abandoned in the 5th century C.E. and later re-established by the Britons. The rebel Queen Boudica of the Iceni sacked and burned the city in 60 C.E. This destruction can be seen in the archaeological record as a burnt red layer of debris. Terra Sigillata is a glazed, mold-made pottery clay impressed with designs. 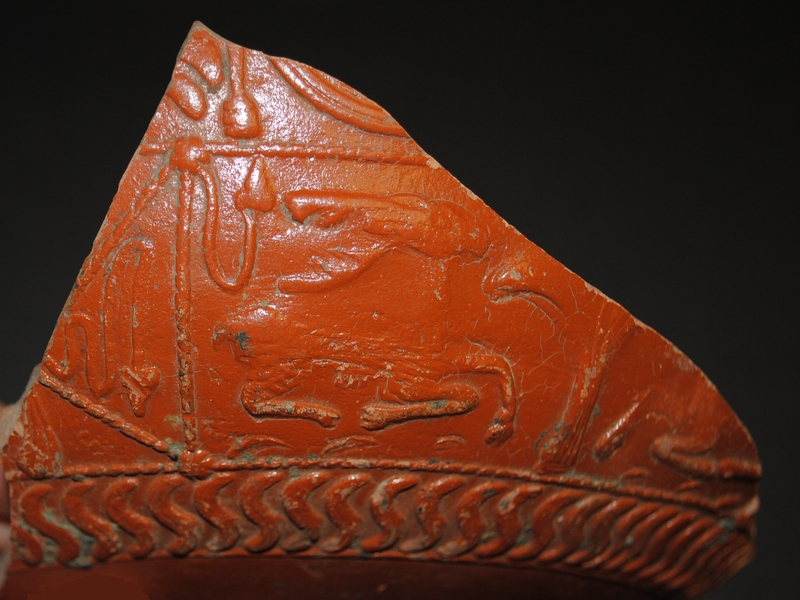 Roman Terra Sigillata often features low-relief decoration, such as the examples seen below. They are decorated with an Egyptian motif, which was a Roman province at the time. This type of pottery is very common in the Roman Empire and would have been used by middle class citizens as daily dishware. The shape and decoration mimicked the expensive silverware used by the upper classes. Very little high quality silverware from this time period can be found today as most would have been melted down for the valuable metal. Temple of Mithras was discovered on Walbrook Street in London, UK in 1954. Four years earlier, before the discovery of the temple, our Roman Britain artefacts were excavated from a nearby WWII bomb crater. Both the bomb crater and the Temple of Mithras site was also excavated by W.F. Grimes. Since the artefacts in the roman Britain collection were found near the Temple and date to relatively the same time period (early to mid 3rd century A.D.), it is likely they are connected in some way. The Persian god, Mithras, was very popular with Roman soldiers, and those garrisoned in Londinium built the Mithraeum c. 240-50 C.E. These temples were often built partially underground to symbolize the cave where Mithras killed the bull. Due to construction on the site, it was necessary to relocate the temple to its current location on Queen Victoria Street, London. Mithras site, London, UK. Photo credit: James Nicholls. This image is licenced under “Attribution-NonCommercial-ShareAlike 2.0 Generic (CC BY-NC-SA 2.0)".